Loughborough, UK-based electronic producer Kel McKeown first emerged back in 2004 as Kelpe on J Saul Kane’s DC Recordings label with his critically acclaimed debut album ‘Sea Inside Body’. His two subsequent longplayers ‘Ex-Aquarium’ and ‘Cambio Wechsel’ certainly sealed his reputation as one of the lushest artists on the roster, increasingly adding more layers to his smooth fusion of warm synthetic textures and hiphop-styled beats, with his more recent work seeing him working with live drummer Chris Walmsley. 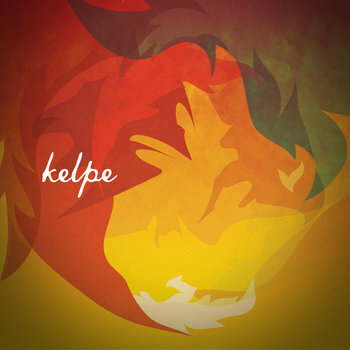 Arriving in June of this year, Kelpe’s fourth album ‘Fourth: The Golden Eagle’ saw him shifting to his own DRUT label, with this remix companion collection arriving just a few short months on its heels. As you’d expect from someone of Kelpe’s tasteful calibre, this is no tacked-on remix exercise, but instead a collection that manages to stand alone in its own right. There’s also a sense that the remixers involved here have been given a free hand to pursue their own individual directions, resulting in a collection that manages to traverse some stylistically diverse terrain. If Mike Slott’s opening reworking of ‘Astromoly’ offers up this collection’s smoother side with a curiously Royksopp-esque male vocal floating and refracting over an airy backdrop of plucked harp textures and streamlined broken-house rhythms, Stone’s Throw’s Mr Chop takes things down into deep synth-heavy robo-funk with his remix of ‘Superzero Theme’ , sending hard-edged snares snapping against overdriven analogue squeals. Elsewhere, Dam Mantle reshapes ‘Glinterlude’ into a vaguely Underworld-esque throbbing storm of pounding techno rhythms and drifting snare programming that sends psychedelic synth arpeggios scattering against a growling, moody bassline, before UK-based newcomer Morgan Hislop’s reworking of ‘Puds’ opts for stripped-back minimalist hiphop / soul, sending harsh drum breaks snapping against stuttered and processed vocal fragments, in what’s easily one of the most subliminally groovy moments here. Consistently inspired and diverse stuff.